"To be abandoned like that was awful," Maurizio Sarri recalled. The news that his star striker was leaving for Juventus hurt like hell. Gonzalo Higuain had just made history, breaking a Serie A goalscoring record many considered to be unbreakable with 36 league goals in a single season (putting him one ahead of Gunnar Nordahl's 1949-50 tally at AC Milan). He did so over the course of a campaign in which Napoli mounted their most serious title challenge since they last won the league in 1990. The team had excelled in the 2015-16 season but they ultimately fell short, beaten to the title by Massimiliano Allegri's Juve. "I could have accepted it if he had gone to the Premier League," then Napoli boss Sarri said. "But not Juventus. Going there made his goodbye all the harder." Within a few months, though, Sarri had mellowed. He forgave and forgot a transgression many Napoli fans still view as a betrayal. "It's a bit like when one of your sons makes you angry," he explained. "You can rip into them for a few days, but at the end of the day he's still your son." 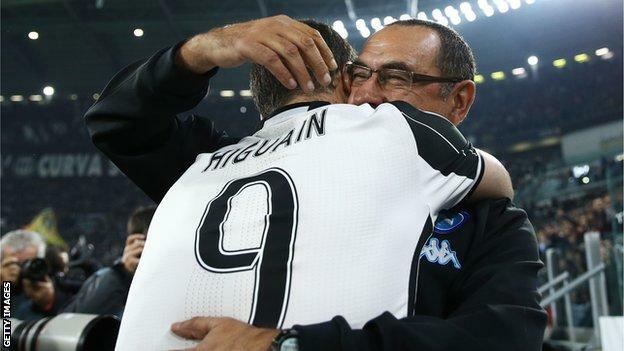 In October 2016, Higuain and Sarri hugged moments before they faced each other for the first time. When the game kicked off, though, there was no room for sentiment. The Argentine scored Juventus' winner and struck 32 times over the course of a year that very nearly ended in a treble. Last year, the goals did not flow as easily - Higuain racked up 23 in all competitions - but he still came up big and shattered Napoli's title dreams. His was the only goal at the San Paolo when the two sides met at the beginning of December in 2017. Had Napoli won that game they would have gone seven points clear of Juventus. Instead the gap was cut to one. Then in April, a week after Juventus lost to Napoli at the Allianz Stadium and looked on the brink of relinquishing their six-year hold on the Scudetto, he completed a last-gasp comeback with an 89th-minute winner against Inter at the San Siro. Sarri maintains that had Napoli gone to bed earlier that night instead of staying up to watch the Juventus game, maybe his team would have ended a 28-year wait for the league. Higuain's goal killed his players' belief and settled the closest title race since 2010, maybe even 2002. The following day Napoli collapsed in Florence. The Partenopei were beaten before they walked out of the tunnel. "We lost the title in the hotel," Sarri said. And still some people outside of Italy wonder what Chelsea's manager sees in Higuain? They question his persistence in signing a 31-year-old who is remembered by many as the player who misses chances and penalties in major international finals and doesn't score enough goals in the knock-out stages of the Champions League. The reception of Higuain in England is reminiscent of the scepticism Zlatan Ibrahimovic had to put up with before he put four past the Three Lions in 2012, including an overhead kick from 30 yards. In Italy, by contrast, El Pipita is the striker to whom all other's look up to and by whose standards everyone else is judged. No one has scored more goals in his five and a half years in Serie A.
Higuain made history working under Sarri, breaking the single season scoring record with a hat-trick on the final day of the season, which he completed with a stunning bicycle kick from the edge of the penalty area. That record had stood since 1950 when the goals per game ratio was much higher than it is today. It is a remarkable feat for a variety of reasons - from the games Higuain missed through suspension to the fact hardly anyone scores more than 30 goals in a single Serie A campaign, let alone 36. If we class the modern era as the beginning of the Champions League at the time of Higuain's record, La Liga has had 10 players hit more than 30 goals. The Premier League has had eight. Serie A has had one - Luca Toni. And when he did it in 2006 he was the first player to do so in 47 years. Higuain's margin of victory at the top of the scoring charts (Paulo Dybala was Serie A's next highest scorer with 19 goals) was the biggest ever, comfortably beating the 10 goals that separated the legendary Giuseppe Meazza and Rodolfo Volk in 1930. Within that context you can perhaps understand why Sarri considers Higuain "the best in the world" in his role, and empathise with those pundits in Italy who always have him in the conversation when it comes to naming the top five centre-forwards on the planet. The straight-talking Sarri famously once said: "If he doesn't win the Ballon d'Or, he's a d**k head." Winning respect outside of Italy and Spain, where he won things with Real Madrid, has proved harder. One of the factors behind that is the profile of Serie A not being what it was in the `90s despite Juventus' regular appearances in Champions League finals and the number of managers recruited from Italy who have no problem winning the Premier League. Another is wider audiences judging him solely on moments in World Cups and the Champions League [incidentally he scored twice in the 2017 semi-final]. Then there's the notion Napoli didn't actually suffer all that much after Higuain left. The football only got better and Sarri reinvented Dries Mertens into one of the best goalscorers around. The last six months haven't exactly helped either. Higuain was, by his own admission, "kicked out" of Juventus but as the club's sporting director Fabio Paratici explained: "To find a better striker than Higuain we only had two options: either Cristiano Ronaldo or Lionel Messi." Every big club in Europe, apart from Barcelona and PSG, would have moved their existing number nine on if they had the means to sign CR7. Higuain should not take it personally. The issue (and perception) though is that he did, falling into the exact same trap as Leonardo Bonucci who moved from Juventus to AC Milan 18 months ago, determined to prove his old team wrong. Emotions got the better of him to the detriment of his form and it was a similar story with Higuain. He scored six goals and set up another - Patrick Cutrone's winner against Roma - in seven games going into October's Milan derby. Higuain was delivering the goods and matching expectation. The turning point came in his reunion with Juventus when he missed a penalty, Ronaldo scored and, to add insult to injury, he received a red card, sparking the mother of all temper tantrums. It's hard to resist the temptation to argue Higuain never recovered. The truth, however, is more nuanced. Milan suffered a devastating injury crisis, which afflicted the creators in midfield. One of the team's most inventive players Hakan Calhanoglu has had a below par season, and while Suso leads the league in assists both Milan's wingers are inverted and tend to come inside onto their stronger foot rather than mix things up and get to the byline for the kind of cut-backs all strikers love to be on the end of. The arrival of Ivan Gazidis as chief executive and Uefa's FFP decision in December also influenced strategy. The warmth Higuain felt from the club as a whole when he signed cooled as they balked at the expense of paying his wages - the second highest in Serie A behind Ronaldo's - not to mention the remaining 45m euros it would have taken to conclude a deal on a permanent basis for a guy in his 30s. Debate rages in Italy about whether Milan are making the right decision in severing ties with Higuain. His replacement Krzysztof Piatek has been the revelation of the Serie A season but may just be a flash in the pan with a ceiling nowhere near as high as his predecessor. The concern for Chelsea is they are signing a striker who is no less sensitive than Alvaro Morata, and someone closer to the end rather than the beginning of their career. But the terms of the deal mitigate the risk as does the father-son relationship between Higuain and Sarri. El Pipita could be the spark that brings Sarrismo and Chelsea to life at Stamford Bridge.